Welcome to San Diego Comic-Con 2014! Whether you’re here in the thick of it with us and checking out things you may have missed or you’re a home viewer wishing you were here – welcome. Over the next couple days you’ll see updates from Amanda Bard, Chelsea Schwartz, Kristen Coveleskie and Travis Black. Sometimes individual posts. Sometimes group recaps like this one. It’s only preview night at Comic Con, but we’ve managed to hit a few key marks of the ‘Con. See advance screening of a new show? Check! Grab some awesome swag from the Exhibitor Hall floor? Check! Random celebrity run-in? Why yes we even did that (Seth Green, on the street corner). Now, as a fan of Arrow, Kristen had high hopes for The Flash pilot (which is also the big bag Chelsea scored at registration this year, we dig the lightning bolt around here!) and overall was quite pleased. Barry Allen (AKA The Flash) is a different kind of hero as he’s actually a good guy! None of this anti-hero business. While you might have a harder time connecting with some of the more peripheral characters, especially what appears to be a love interest for the titular character, the general concept will have you coming back for more. Not knowing too much about the show going into it, Kristen was absolutely thrilled to see Tom Cavanagh (from the beloved Ed and very underrated Love Monkey). He portrays a character with a very intriguing twist that is revealed at the end (we’ll try to keep the spoilers to a minimum). And the rest of the crowd became particularly excited when a certain Starling City resident made a cameo in a pivotal scene. After The Flash pilot the Comic-Con staff informed us of the sad news that the iZombie pilot was not ready for screening. This minor disappointment was quickly erased by a screening of the Constantine pilot. Constantine (the show and the character) posed more questions than they answered, but it was more intriguing than frustrating. The pilot opens with John Constantine as a retired exorcist hiding out in some type of mental institution. Events unfold, bringing him back into a former life with the introduction of Liv Aberdine, a young woman with unique abilities and a link to John’s past. The tone of the show feels very much like another TV show about demon hunters, Supernatural. Now that cross-over episode would be amazing! Chelsea spent her time waiting in line at the ABC booth on the Exhibitor Hall floor trying to score that elusive Once Upon A Time pin, which she got! 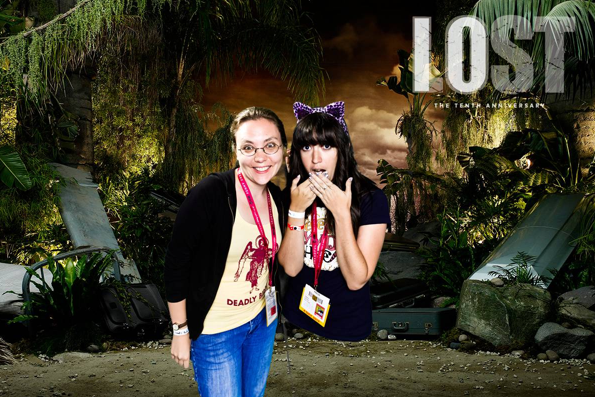 The booth has several activations for other shows including a photo booth set-up for Lost which is celebrating it’s 10th Anniversary. The line moves slowly but it definitely worth the wait. In fact, our giddiness in the Galavant sing-a-long scored us autograph signing wristbands for the Toy Story That Time Forgot signing! Other scores from the Exhibitor Hall included a couple of free books from the Penguin booth (#1028), an exclusive Comic-Con Mad Libs (#4612), a very cool Iron Man art card from the Marvel booth and more. What are we looking forward to Thursday? The Penny Dreadful panel and the TV Land panel with Betty White! More soon.